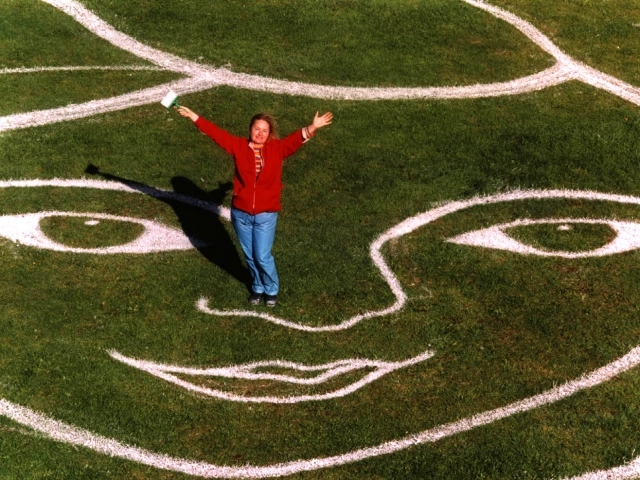 The monumental land art ‘The Angel of the Lee Valley’ created by artist Denise Wyllie was a chalk drawing of a gently smiling angel who spread her wings over Leyton Marsh in the city of London. 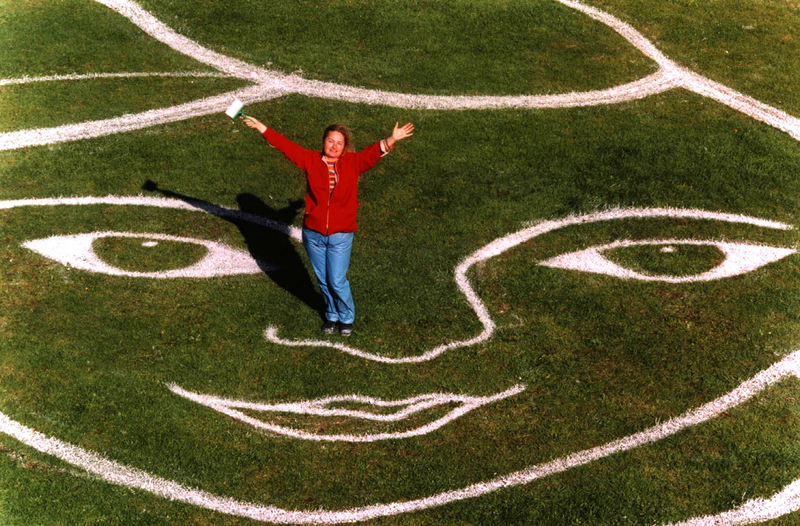 The drawing – created in 1999 as a pre-millennium art project – was the size of a football pitch on common pasture. 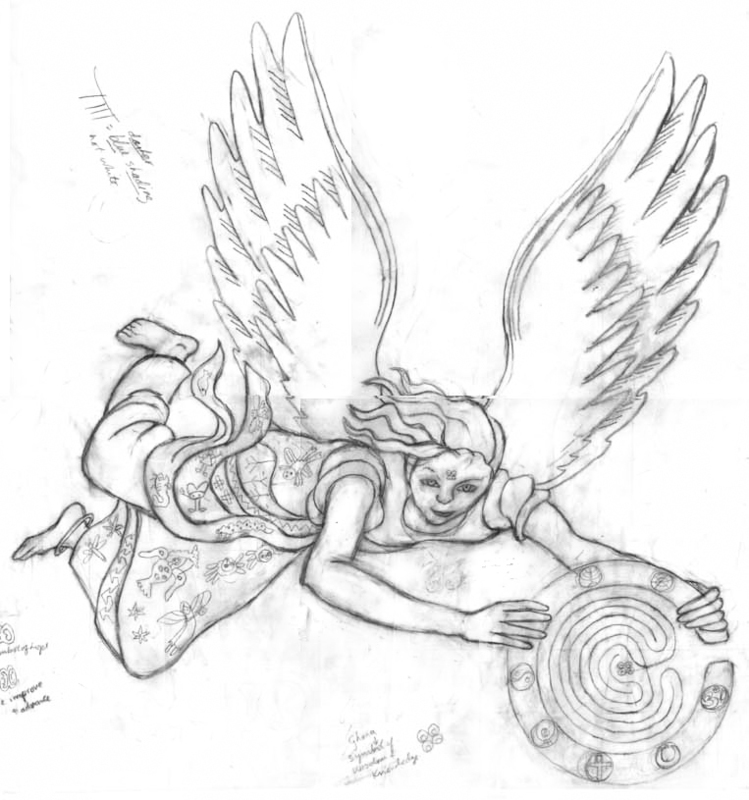 The angel held a maze in her outstretched arms encompassing religious and cultural symbols representative of the local neighbourhood. 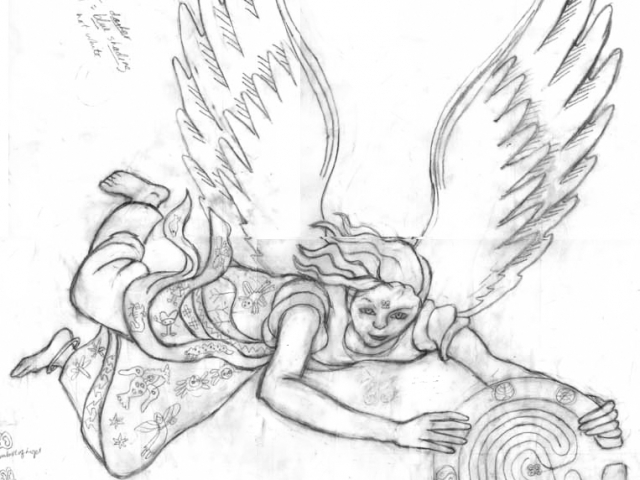 Incorporated in the angel’s gown were designs made by local people in art workshops run by the artist. 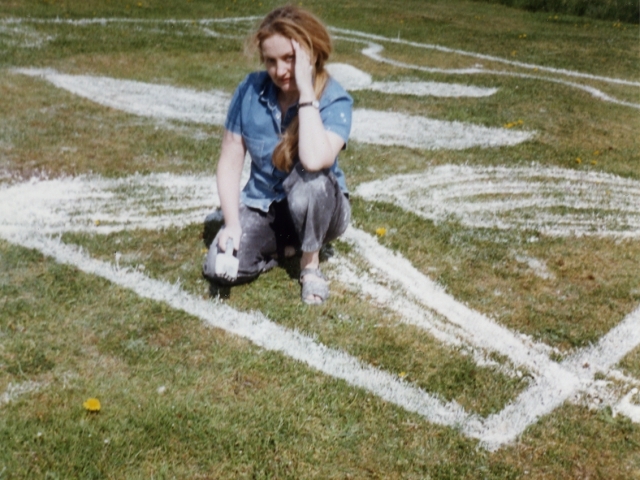 Together with LVRP Wyllie researched the possibility of planting wild grasses and wild flowers and grasses to create the lines and colours of the angel but decided that drawing with football pitch linesman’s chalk was the best solution as it would gradually wash away and not disturb the natural environment. 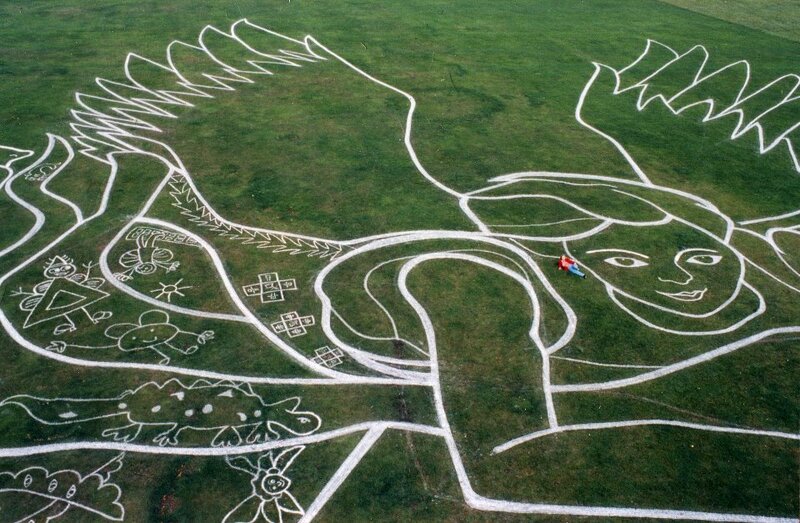 The final design shows the green angel outlined in white chalk, like the ancient pagan drawings cut into hillsides. 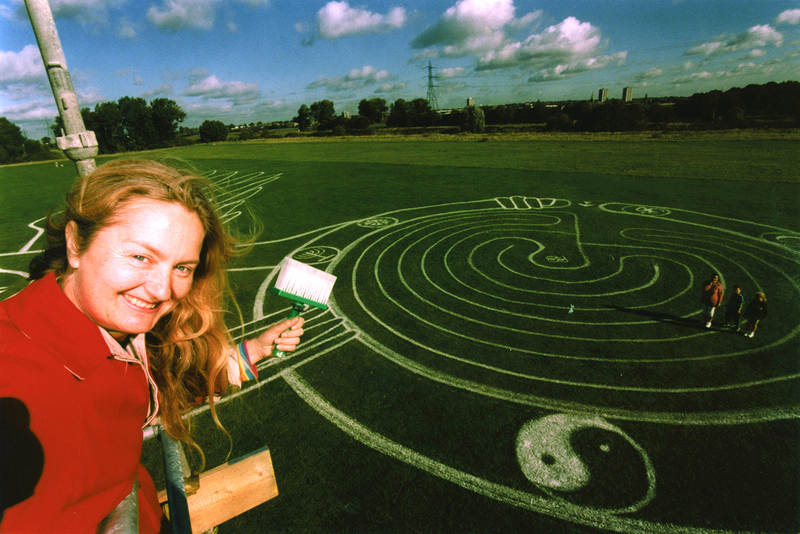 An important part of the project was lead-in time when the artist collaborated with community groups during practical art workshops. Wyllie did not want to ‘just plonk an intrusive piece of art down anywhere’ but develop a dialogue with the local inhabitants so the work would be of special significance to them. 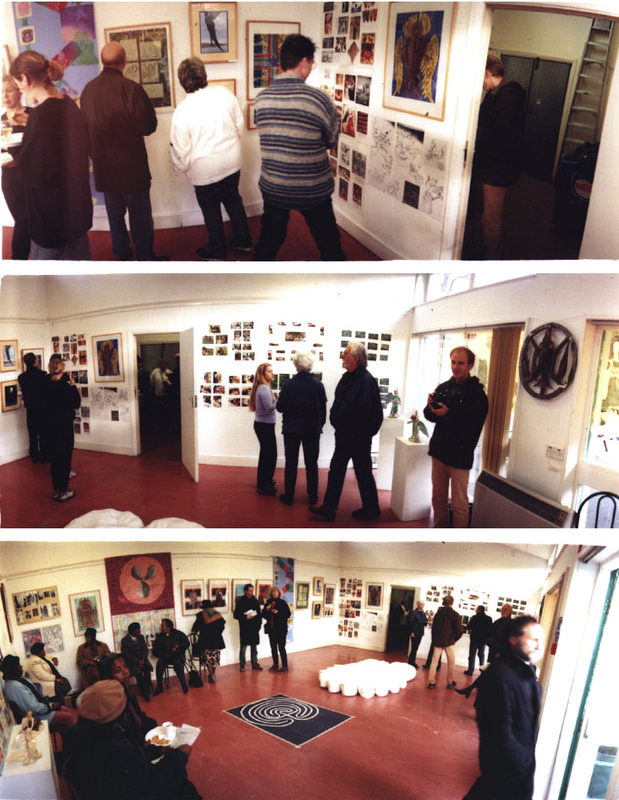 By choosing a common theme that everyone could relate to, the artist encouraged people who might not usually experience art to participate. Wyllie says ‘it was an exciting challenge to take on board ideas discussed, such as those of the seniors of the African Caribbean Welfare Association who wanted to send a message of happiness and responsibility to their descendants and the children of the Kreative Kids Klub who wanted a strong, friendly ‘superwoman’. 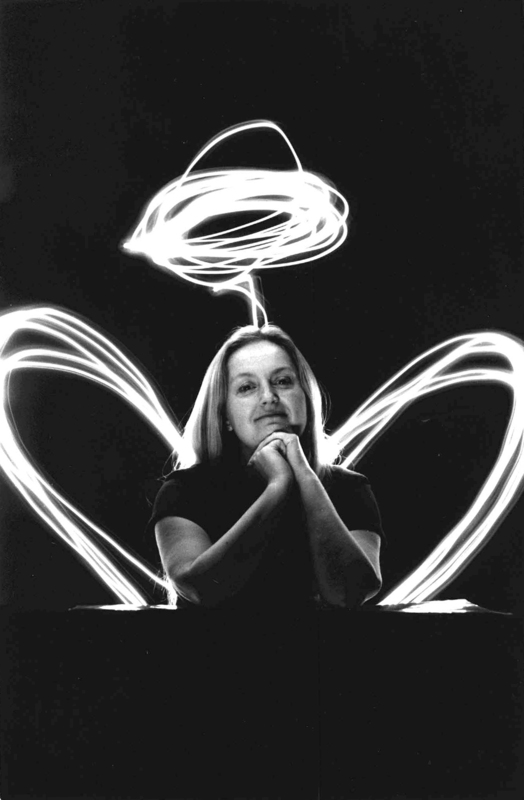 “I realised that I had succeeded when local people campaigned to have the ‘life of the angel drawing’ extended. 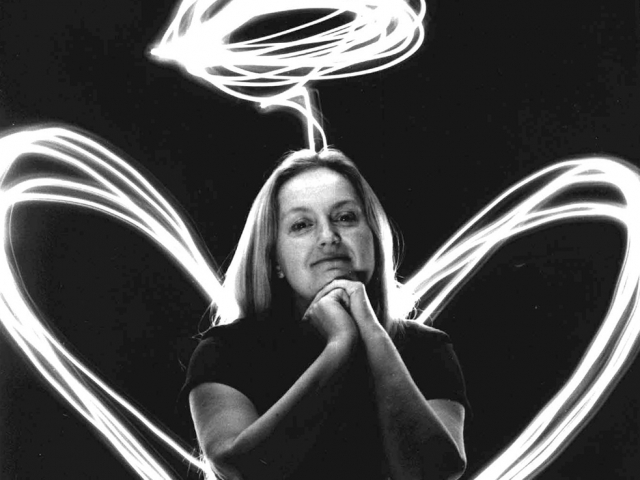 Wyllie incorporated peoples’ designs within the angel’s gown in order to acknowledge and empower those whom she worked with for so many months. They included abstract patterns from the Moslem ‘Garden of the Angel’, flying superwomen from the Kreative Kids Klub and wild life creatures from the marshland drawn by children from St Saviours Junior School. 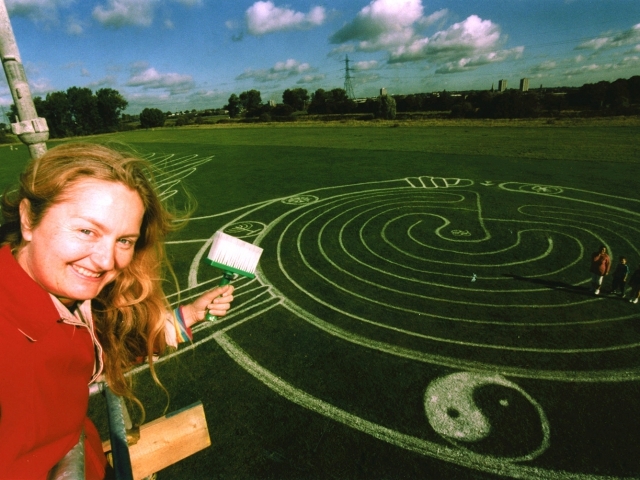 Around the perimeter of the interactive maze were symbolic representations of some of the different religions of East Londoners. 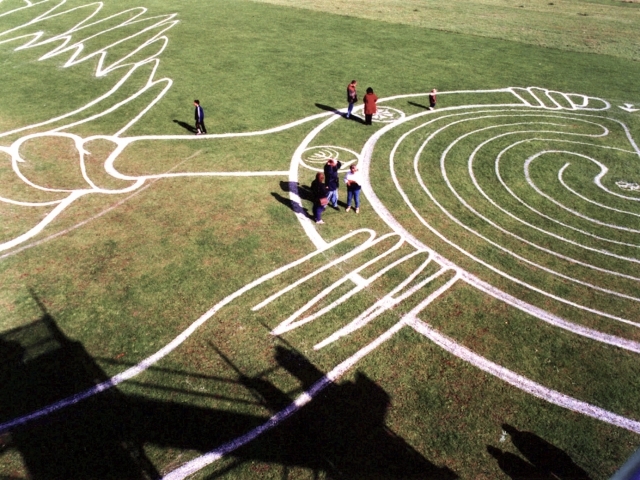 The maze itself led to the centre where there was a symbol of knowledge from Ghana. 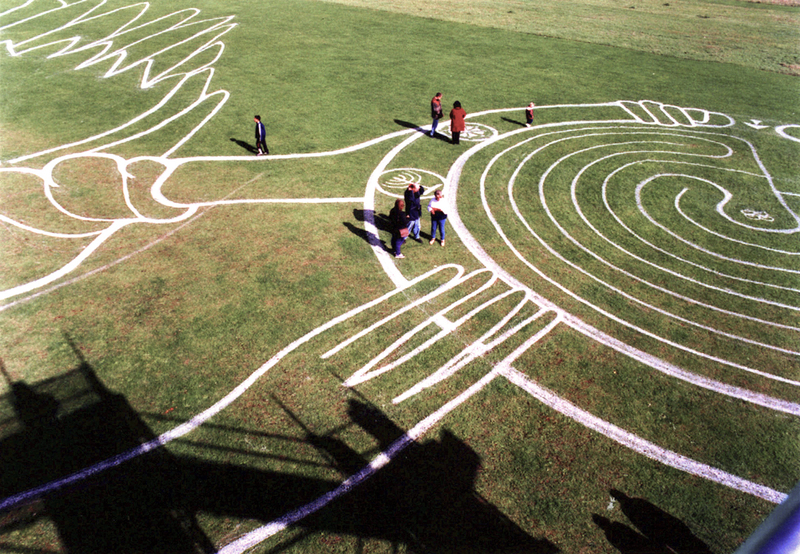 Wyllie’s intention and hope was to show that all religions share the same basic aim of wisdom. 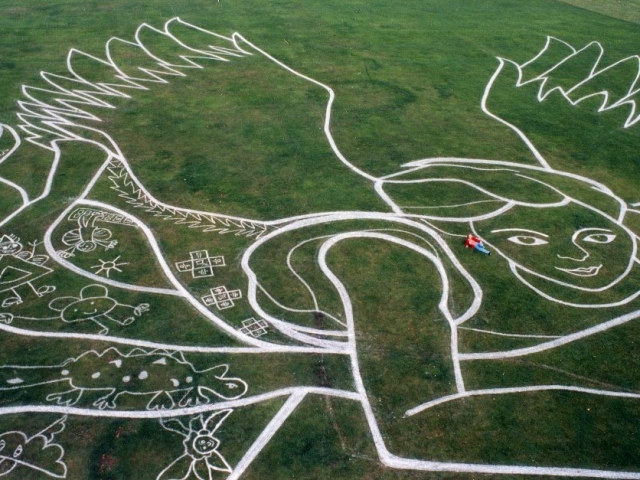 The kind angel represents a celebration of the diversity of the community coming together and enjoying nature on their common land. 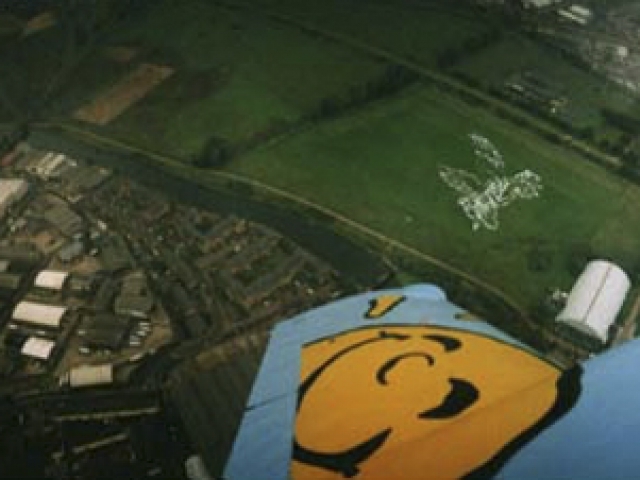 One could view and interact with the angel either from the ground or above – from a viewing tower or by hot air balloon. 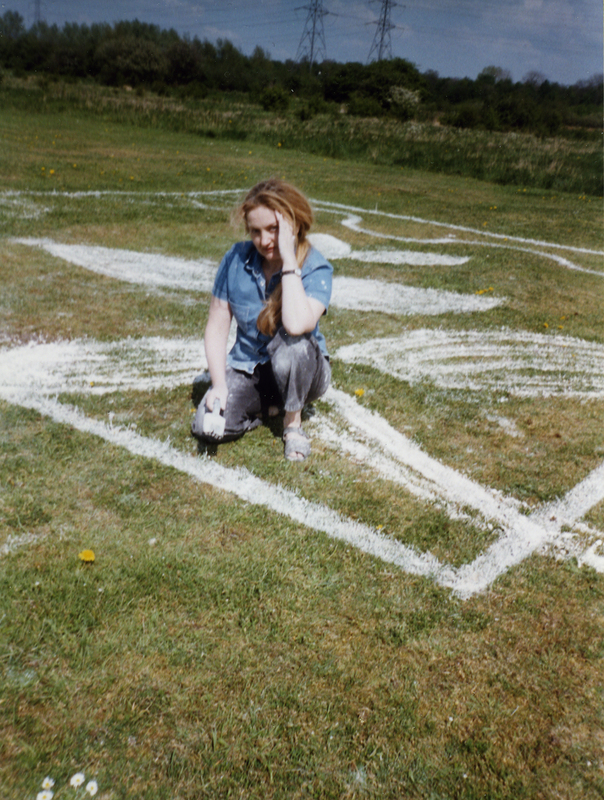 Wyllie intended that the artworks message developed in the workshops and to be then further communicated through experiencing the artwork in the landscape. 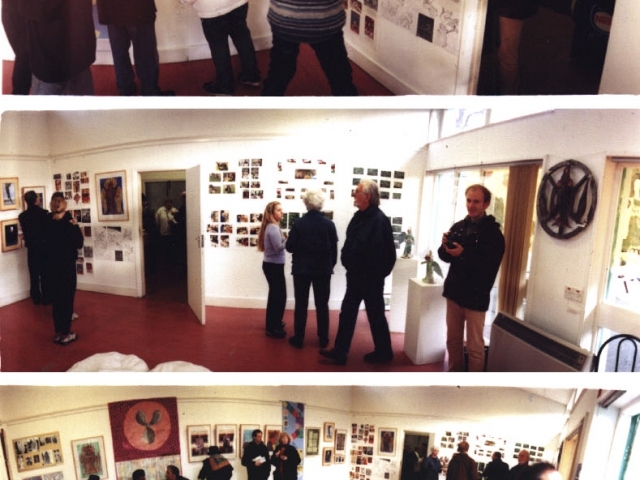 Later documentary photographs of The Angel of the Lee Valley Project plus the artists drawings and the art workshop outcomes were exhibited together at Waltham Forest’s William Morris Gallery nearby. To celebrate the ‘arrival’ of The Angel of the Lee Valley there was an Opening Family Day with a viewing tower and free rides from tethered hot air balloons so people could see her from above. The opening event also included music tents with Irish bands and Indian food. There was an all female fire crew with their fire engine plus park rangers who invited families to take part in environmental task workshops such as planting rare cherry birch trees, specific to this local natural habitat.